Gibson Dunn | Blas, Lauren M.
Lauren Blas is a litigation associate in the Los Angeles office of Gibson, Dunn & Crutcher. She practices in the firm’s Class Actions, Appellate and Constitutional Law, and Labor and Employment practice groups, with a focus on complex litigation and class actions in the trial courts and on appeal. In 2018, Ms. Blas was named a “Rising Star” in Appellate Litigation in Southern California by Super Lawyers Magazine. Ms. Blas has represented clients in employment, consumer and securities class actions, and has litigated a wide range of appellate matters. She has briefed over a dozen appeals in the state and federal courts, and has argued before the U.S. Court of Appeals for the Seventh Circuit, the California Court of Appeal, and the Wisconsin Supreme Court. Ms. Blas was also a core member of the appellate team in New Jersey’s successful challenge to the Professional and Amateur Sports Protection Act. After nearly four years of litigation, the U.S. Supreme Court held that the Act violated the Tenth Amendment and invalidated it in full. Successfully obtained decertification of an 11,000-member class in a wage-and-hour action on the eve of trial. Defeated motion for $80 million in penalties and liquidated damages following a jury trial in a wage-and-hour class action. Representing communications company in opposing class certification in one of the largest data breach cases in history. Representing information technology company in a putative class action alleging race and national origin discrimination. Representing retailer and beverage manufacturer in separate putative class actions involving false advertising claims. Persuaded the U.S. Supreme Court to grant certiorari in a matter involving the statute of limitations for the False Claims Act. Secured multi-million dollar reduction of a punitive damages award on appeal following a jury verdict in an employment discrimination action. Obtained reversal on appeal of a $50 million summary judgment award against an individual client. Obtained affirmance on appeal of judgment of dismissal in putative class action against a leading accounting firm. Representing a leading technology company in a significant employment class action before the California Supreme Court. 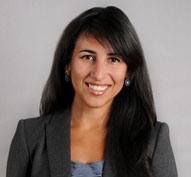 Ms. Blas also maintains an active pro bono practice, including drafting amicus briefs in the U.S. Supreme Court and representing clients in removal proceedings both in the immigration courts and on appeal. She is also currently representing an actress, writer, and humanitarian in an action alleging defamation, interference with prospective economic relations, and unfair competition against film producer. She is also a member of the advisory committee for the Los Angeles Judicial Internship Opportunity Program. Before joining the firm, Ms. Blas served as a law clerk to the Honorable Sandra S. Ikuta of the U.S. Court of Appeals for the Ninth Circuit. Ms. Blas graduated from Yale Law School, where she served as a first-year writing instructor, a teaching assistant in civil procedure, and managing editor of the Yale Journal on Regulation. She holds Bachelor of Arts degrees in Economics and History from Yale, where she graduated with honors and distinction in both majors. Ms. Blas is a member of the California and New York bars, and is admitted to practice before the U.S. Supreme Court, the U.S. Courts of Appeals for the Seventh, Ninth, and Tenth Circuits, as well as all U.S. district courts in California.